South Korea’s electric vehicle market has expanded sharply as a result of government incentives and improved infrastructure that have encouraged purchases of green cars. According to the Ministry of Environment on Wednesday, sales of electric cars in Korea reached 32,000 units last year, overwhelming cumulative sales from 2011 to 2017. A total 57,000 electric cars are currently on the roads in Korea after sales doubled on annual average since 338 units in 2011. 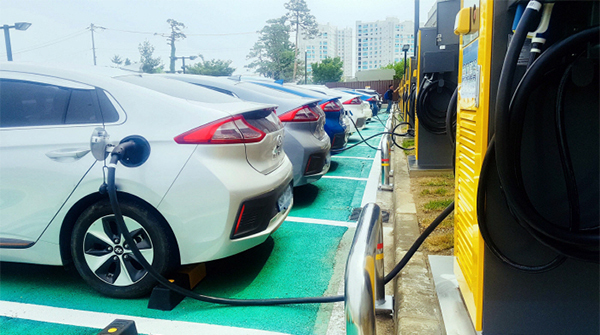 The growing electric car market in Korea comes as the government has been putting out efforts to encourage purchases by providing related infrastructure such as charging stations as well as incentives. The environment ministry has so far installed two or more fast-charging stations at expressway rest areas and improved incentives system. As of 2017, China has the most number of fast-charging stations with 8.8 units per 100 electric vehicles, followed by Korea and Japan with each 7 units, and Germany 3.5 units. Korea’s electric car market is the fifth-largest in the world in terms of sales as of last year, trailing behind China with 385,000 units, the United States with 140,000 units, Norway with 38,000 units, and France with 31,000 units. Korea with 29,000 units is followed by Germany with 27,000 units, the ministry said. Sales of hydrogen-powered cars quadrupled from past five years to 712 units in 2018. Currently, 889 hydrogen-powered cars are on the roads in Korea, making it the third-largest market in terms of annual sales after the U.S. and Japan. There are also 14 hydrogen stations in Korea as of last year, the largest number after Japan, Germany, and the U.S. The environment ministry plans to boost the number of electric vehicles in Korea to 430,000 units and hydrogen-powered cars to 67,000 units by 2022.